Hamilton Beach Premium Big Mouth 2-Speed Juice Extractor is a great alternative if you’re looking to buy a Breville Juice Fountain Plus. At a cheaper price, you’ll enjoy the same features plus you’ll get a 40 oz BPA-free pitcher with lid and froth separator. This will ensure less foam on your juice and it makes pouring a lot easier. It also includes an easy sweep cleaning tool which makes cleaning the cutting disk safer and easier, not to mention the three-year warranty coverage. Like all Hamilton Beach’s big mouth juicer it also has a 3-inch wide feeding chute that can accommodate whole fruits and vegetables and big slices of produce which will literally cut your preparation and juice extraction time. The dual speed setting allows you to process a wider variety of produce such as hard and soft fruits and as well as citrus fruits. You can try more juice recipes than a standard one-speed centrifugal juicer. Fast juicers are generally easier to use. It has lesser parts and the feeding chute is pretty big. This cuts your preparation time in a few minutes and juice extraction time in a few seconds. The new spout design and the anti-spill juice jug makes it even easier to use. You can lift the spout to prevent drips when the juice jug is full. The juice jug itself was designed to prevent splashes, you can easily pour the juice into your favorite juice container, and I really like that it’s BPA free despite the juicer itself isn’t. External pulp ejection is a must when choosing a juicer, it makes uninterrupted juicing possible. Luckily Hamilton Beach Premium has an extra large pulp bin. Except for the motor base, all plastic parts of Hamilton Beach Premium Big Mouth are dishwasher safe. However, don’t put your dishwasher in “SANI” mode as it could warp the plastic parts. Generally speaking, it should take you more or less 5 minutes to clean it even without a dishwasher. Clean your juicer right away to avoid residue build-up especially on the cutting disk. Since you do have easy sweep cleaning tool you don’t have to worry about the hazards of getting your hand or fingers lacerated. Even with froth separator, juice extracted from fast juicers are at high risk for oxidation. This is a trade-off of being fast. However, as long as you drink your juice right away or at least within 15 minutes you’ll still enjoy the maximum nutritional value of the juice. Oxidation is significant with high-speed juice extractors, it’s something that can’t be avoided with thousands of RPM. The quality of the juice will suffer if you delay drinking your juice. The best way to overcome this is really drinking it as soon as possible. In addition, the plastic parts of this electric juicer are not BPA free (except the juice jug). What Kinds of Produce Can Premium Big Mouth Juice? Hard produce includes pear, cucumber, cauliflower, fennel, asparagus, celery, turmeric, broccoli, pumpkin, sweet potato, ginger, yakon, watermelon, pepper, apple, carrots, bitter gourd, garlic, cilantro, beets, and pineapple. Citrus fruits include tangerine, lemon, grapefruit, mandarin, lime and orange. Soft fruits are basically non-juicable items, so expect to yield a puree when processing papaya, kiwifruit, blackberry, strawberry, cranberries, grapes, mango, pomegranate, melon, peach, tomato, and avocado. 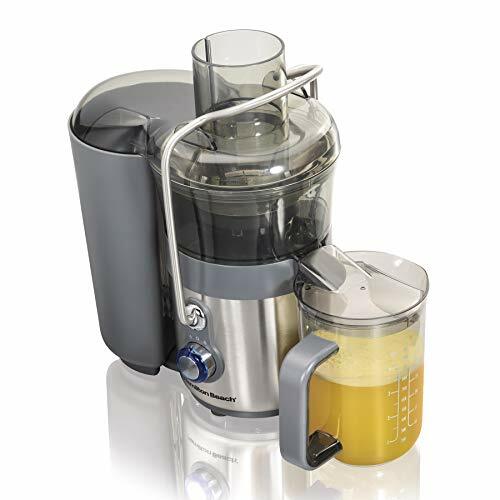 Hamilton Beach Premium Big Mouth Juice Extractor is indeed a premium but affordable centrifugal juicer. I would say it could offer the best bang for your buck if you are really into centrifugal juicing machine. It’s the best dual speed fast juicer that you can get in the 100 dollar range. To sum up, it’s affordable, it has a dual speed mode, dishwasher safe, easy to clean and offers a premium look. If you prefer quality versus affordability, cold press juicers are the way to go, but if you prefer the other way around this machine could be a perfect match for you. In terms of functionality, your money will be well spent on this Hamilton Beach juicer.